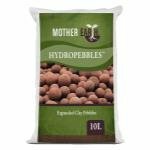 Hydroton clay pebbles or rocks are made from pH neutral clay. Their air to moisture ratio makes them ideal for hydroponics. They can be used to fill plastic net cups in aeroponic and NFT Nutrient Film Technique systems, as a medium for drip irrigation systems, or as a medium for container gardening. 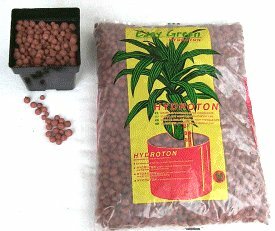 Hydroton is an expanded clay medium manufactured in Germany and is well suited for growing larger plants like tomatoes and peppers. It holds water extremely well and offers good capillary action. It is reusable, clean, and odorless. The 10 liter bag will fill approximately 24x 3, 21x 3.75", 10x 5", 8x 5.5, or 4 - 8 net pots. The 50 liter bag will fill about 4x 5gal containers. Perfect for passive, wick, and subirrigation use, individual hydroculture pots or hydroponic systems. Reuse over and over by rinsing out roots then sterilizing in a very mild bleach solution about 1/2 cup per gallon of water. Rinse well before using.